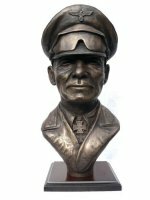 Erwin Rommel also known as the Desert Fox was a famous German Field Marshall of World War II. 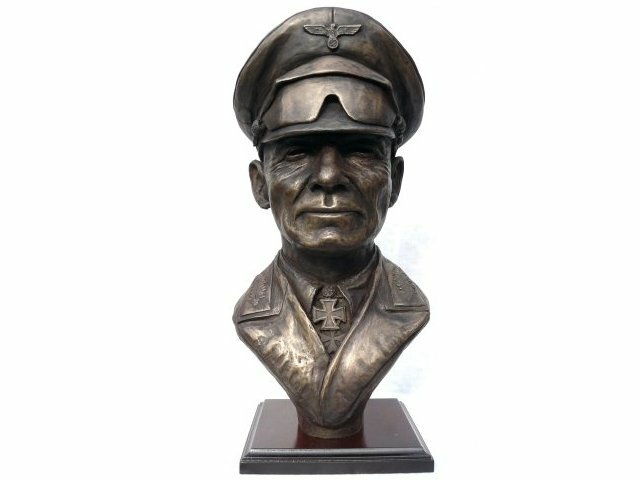 During the Second World War he commanded the 7th Panzer division during the invasion of France. 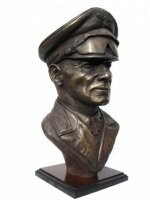 Rommel is regarded as a chivalrous and humane officer because his Afrikakorps was never accused of any war crimes. Approached in 1944 to join the plot to assassinate Hitler Rommel refused suggesting Hitler be arrested and brought to trial. Hitler discovered Rommel was plotting against him but because of his great prestige Hitler allowed him to commit suicide and promised him the protection of his family if he commited suicide rather than be tried and executed for high treason. Erwin Rommel took the honourable decision and the real reason for Rommel's death only emerged at the Nuremberg trials. 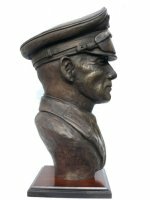 This cold cast Bronze Rommel 'The Desert Fox' Bust is made entirely by hand by sculptor Peter Close in his studio in Somerset. 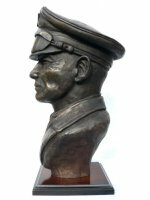 Each limited edition Rommel 'The Desert Fox' sculpture is hand engraved by Peter with its own unique edition number and will come to you with a signed certificate of authenticity.